On 30th of December 2016, the National Bank of Moldova puts into circulation as legal tender and for numismatic purpose, commemorative coin Red-breasted goose under Red Book of Republic of Moldova coin series. on the central part – the Coat of Arms of the Republic of Moldova; on the upper part – the year of issue „2016”; on the bottom part -the inscription „50 LEI”; following the coin circumference– the inscription „REPUBLICA MOLDOVA” is engraved in block letters. 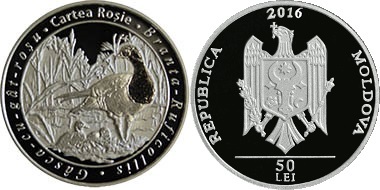 on the central part – a red-breasted goose with two little goslings on a vegetation background; following the coin circumference – the inscriptions “Cartea Roșie", " Branta-Ruficollis" and " Gâsca-cu-gât-roșu " are engraved.